Julia and I are so thankful that Wichita happens to be in my sister Emily's path home from college in Ohio. 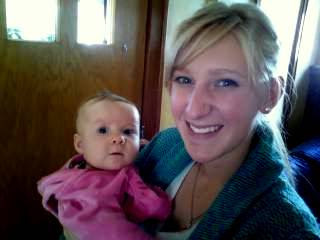 Emily has been taking care of Julia during my proverbial (but brief) absence from my full-time mothering duties. The medicine I am on in preparation for the iodine treatment tomorrow has left me in no shape to be keeping up with Julia's antics. Julia loves spending time with Emily and we hope that we can return the favor somehow some day. Fortunately, Julia slept for nine whole consecutive hours last night and is already back down for her first nap of the day. Little peach. Don't you love how they're extra perfect when you suddenly have help? Darlings. Julia is getting too stinkin cute!!!!! a big. wow. its like she' not an infant anymore!!! !